Royal Dutch Shell will stand trial in New York next week for its complicity in the 1995 torture and execution of Nigerian environmental activist Ken Saro-Wiwa and eight other members of his ethnic Ogoni group for what has been proven to be trumped up charges. Saro-Wiwa’s son, Ken Wiwa Jr., explained the scenario that led to his father’s murder in The Guardian this past Sunday. Ken Saro-Wiwa’s real “crime” was his audacity to sensitise local and global public opinion to the ecological and human rights abuses perpetrated by Shell and a ruthless military dictatorship against the Ogoni people. The success of his campaign had mobilised our community to say “No to Shell” and to demand compensation for years of oil spills that had polluted our farms, streams and water sources. My father called the world’s attention to the gas flares that had been pumping toxic fumes into the Earth’s atmosphere for up to 24 hours a day since oil was discovered on our lands in 1958. He accused Shell of double standards, of racism and asked why a company that was rightly proud of its efforts to preserve the environment in the west would deny the Ogoni the same. In response to his campaign, Shell armed, financed and otherwise colluded with the Nigerian military regime to repress the non-violent movement, leading to the torture and shootings of Ogoni people as well as massive raids and the destruction of Ogoni villages. The indigenous people have been cheated through laws such as are operated in Nigeria today. Through political marginalization, they have driven certain people to death. In recovering the money that has been stolen from us, I do not want any blood spilled, not of an Ogoni man, not of any strangers amongst us. We are going to demand our rights peacefully, nonviolently, and we shall win. 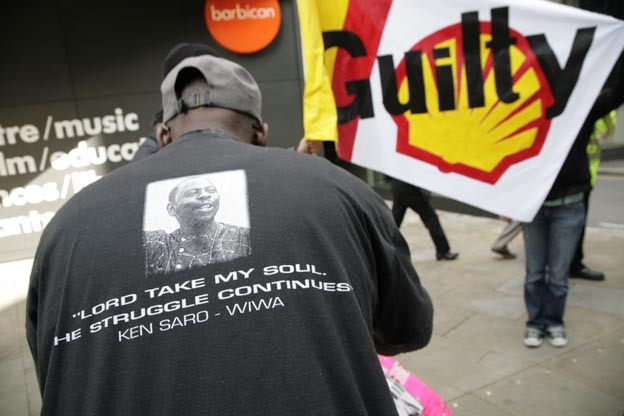 For more on the trial, Saro-Wiwa and Shell’s abuses visit The Case Against Shell and the Shell Guilty Campaign.